Have been on the road (sans laptop). Drove some 4,000 miles around the country. The first leg was 2,000 in the South and I must go back. Experienced real Southern hospitality and some of the best food ever (special shoutout to Hank’s in Charleston and the John Rutledge House Inn). Toured Ft. Sumter, took a buggy around old Charleston, saw a bit of Atlanta…. next time, Savannah and the Outer Islands. Second leg of the trip involved driving the length of Illinois on the way to Austin. Sorry, Illinois, but you are entirely too long. Had to stop in Memphis to see Graceland and had a memorable lunch at Marlowe’s. Excellent ribs. By now you probably suspect two things: I ate my way through the South and I am not a vegetarian. True on both counts. Graceland wasn’t quite what I expected, though I’m not sure what that was. Perhaps it’s just that when things are so much a part of our culture and mythology, we think they will be enormous, like meeting someone famous who’s unexpectedly short. Anyway, it was a lot of fun. Bonus surprise, great organic food at Boulevard Bread Co in Little Rock, AK and amazing strawberries. 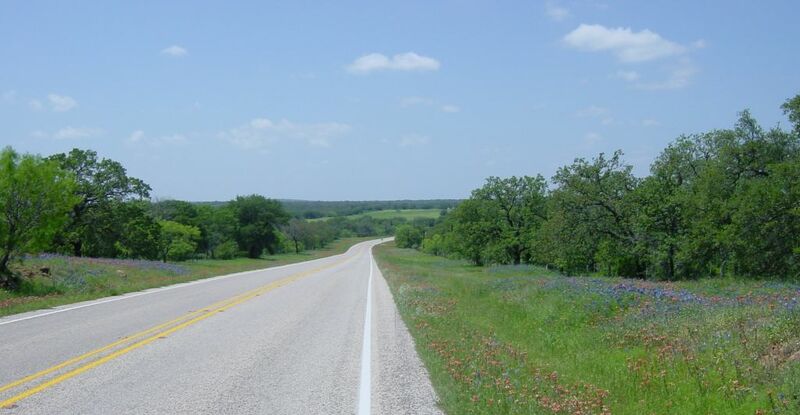 Hwy 17 in Texas is beautiful (see photo above) and Llano was an exceptionally friendly town. Austin’s a very cool town and the combo of Guero’s tacos & handshaken margarita with Amy’s ice cream for dessert revived me to be able to drive two 12 hour days back to back. It is good to be home. Now I am reading in preparation for a workshop at the Norman Mailer Writers Colony. Just found out I will be meeting Michael Lennon, Mailer’s close friend and now biographer. Also have a workshop submission to prepare, so back to that. Hopefully it will lay the groundwork for the next novel. My friend and mentor, Rob Roberge, has a blog up and running with links to articles he’s written – good stuff – and you’ll learn something about writing.